Share the post "City of Amsterdam Foreclosure List: A Look at the Numbers"
I crunched some data on the foreclosure list of city properties in the interest of understanding what really is happening versus relying the guesswork and speculation. Some findings of interest follow. For notes on my analysis, those are at the end of the post. I’ll be posting some followups on this as much of what I see as comments here and elsewhere on this issue is incorrect. This contradicts the usual assumptions that the problem is solely outside investors to the city. 2) The major portion of the liability is personal versus corporate. I think this is a relatively positive indicator as corporations will be more difficult to recover monies from due to corporate protections if the foreclosure should proceed. 4) Here is a distribution of number of properties by amount owed. 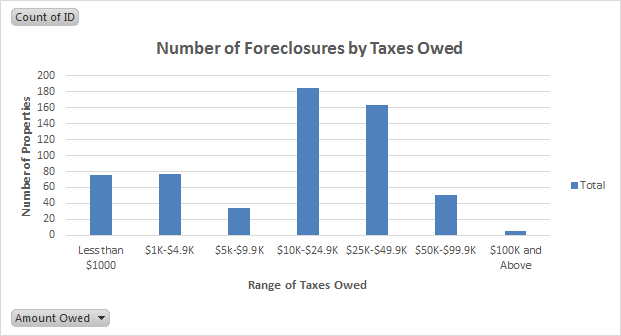 The bulk of properties owe between $10-$50K in back taxes. 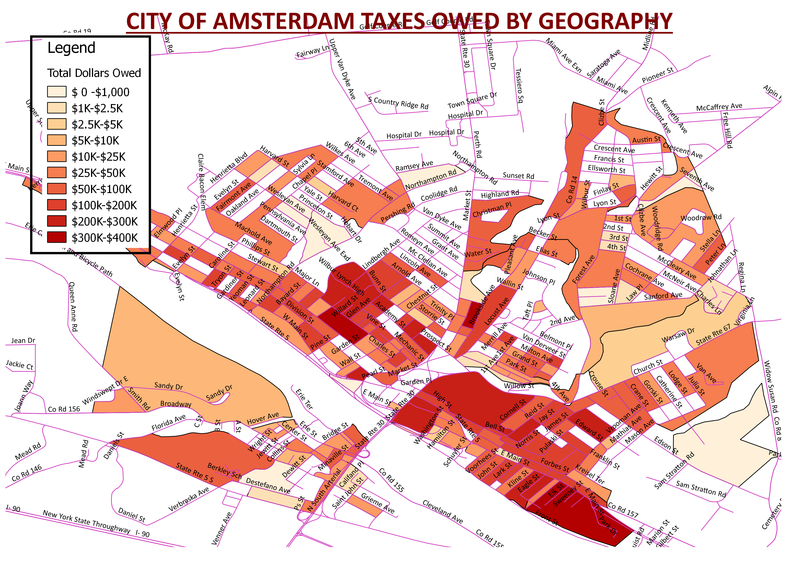 Finally, here is a geographic look at the where the properties are located by amount of taxes owed. The brighter the color, the higher the total taxes owed for that area. (please see the legend for details). Also note how ‘more demolition at $40-$50K per property’ is NOT then answer to this problem….